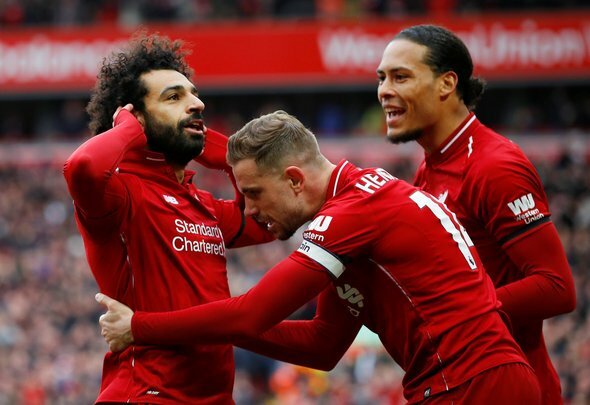 Former Premier League striker Jimmy Floyd Hasselbaink has revealed he was stunned by Mohamed Salah’s sensational strike for Liverpool versus Chelsea as he insists he has never seen the Egyptian take such a perfect shot before. The winger sent Anfield into raptures which his long range rocket which flew past Kepa and into the top corner of the Blues’ net, helping Jurgen Klopp’s side pick up a crucial 2-0 victory. However, Hasselbaink revealed he was not expecting to see Salah blast the ball on goal because it is not something he believed the forward had in his locker. Speaking on beIN Sports the former striker said: “I did not expect that he was going to do that because I’ve never seen him hit a ball like that. Salah has scored some brilliant long range efforts in his time with Liverpool but perhaps none were as sweetly struck as Sunday’s effort. It was laser accurate as it arrowed into the Chelsea goal and you would expect that his confidence is sky high once again after a recent period of poor form. Maybe Hasselbaink does not watch many Liverpool games now his career has come to an end, because you should always expect the unexpected from the Reds star. He has the ability to turn on the magic in the blink of an eye and make something special happen – which is exactly what happened at Anfield against Chelsea. Now the opposition know he can rifle off a pinpoint accurate shot if he wants to and they will have to find a way to stop him doing so in future games. Otherwise the end result could be exactly what Chelsea suffered on Merseyside.